My character has changed a lot since coming to Japan. Part of the reason for that is age. When you transition from mid-20's to late 40's, changes are inevitable. You start talking about how people were in your day and whining about how everything was better. People were politer. The planet was cooler. Food was less mutated. People certainly could spell better. One of the many things that have changed is my perception of food. Back home, I saw something which said "dessert" and I concluded that it was sweet. Japan, on the other hand, has somehow conditioned me to second guess whatever I'm buying. Sure, it says it's for dessert, but that doesn't mean it's going to be sweet. Right? The Japanese food manufacturers are constantly positioning products as one thing and then I discover it's another. Right? Am I right? No, I'm wrong. When this says "dessert cheese", it means it is very sweet (sugar is the second ingredient, I should have figured it out). I was hoping this was a pungent cheese with nuts that was being offering as an accompaniment to fruit for an elegant dessert pairing which would offer a sophisticated ending to a meal. No, it is not only sweet but pretty disgustingly so. 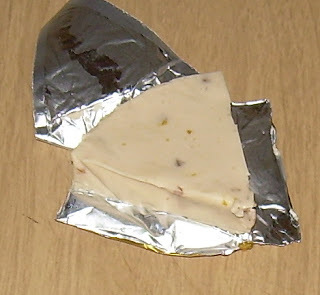 I had the first wedge all by itself and it was essentially sweetened cream cheese with tiny microscopic fragments of nuts embedded in it. The problem with this wasn't that it was sweet, though it was too sweet, but rather that it didn't have much of a flavor profile. The nuts are supposed to include hazelnuts, almonds and walnuts, but I couldn't really taste any of them distinctly or even as a nutty mass. There was just too little of it. Since this was cream cheese, it was so mild that there was no cheese flavor to speak of and what little there was was overwhelmed by sugar. The only way that I made this work for me was as a spread on something less sweet. It'd be good on Carr's whole wheat crackers (which are modestly sweet and have a cookie-like texture) and I spread it on some pumpkin muffins that I made. Ultimately though, I ate the rest of this because I didn't want to "waste" what felt like real food. I paid 258 yen ($3.36) for 108 grams (3.8 oz.) and damn it, I was going to choke it down through time. However, there's no way I'd ever buy this again. I would have guessed it was savory as well, like the cheese course at a restaurant. I'm a big cream cheese fan, is plain cream cheese milder in japan? Rodzilla: I think it depends on the cream cheese. This stuff definitely was milder, but I've had things which were more conventional in taste (i.e., more "sharp", like Philly Cream Cheese). 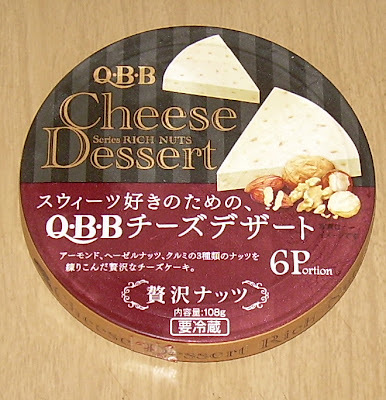 Daedal: I love cheesecake as well, but this was too soft, lacking in richness, and strangely sweet to work for that. That doesn't sound delicious. I've already tried different sweet cream cheese. But they have usually taste me not so good. I prefer more savory cream cheese.